The United Church of Christ is relatively young and an historically older denomination. The new church resulted from the merger of two historic American denominations (the Evangelical and Reformed, (E & R) and the Congregational Christian Churches), both of which had much in common. 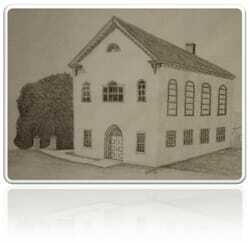 Our local church traces its roots through the history of the German Reformed Church. The New Denomination was born from these two mature parent bodies on June 25-27, 1957. It was, as the dates indicated, a slow delivery, but a successful and happy one nevertheless. Both branches of the United Church of Christ go back to the initial Protestant Movement. Of the two, Evangelical and Reformed Church had an older history, but not by much. The roots of the E & R Church trace to 16th century Europe, about the time Martin Luther nailed his 95 thesis to the church door at Wittenberg, Germany. In Zurich, Switzerland, Ulrich Zwingli pressed for a return to the apostolic Gospel. These scattered sparks of theological self-scrutinizing finally put the continent ablaze. Eventually this essentially intellectual and spiritual revival produced economic changes. In Germany, Luther and Melancthon protested against the error of the Church of Rome. Zwingli and Calvin, motivated by the same Scripture and Spirit, attempted to call the Church to a similar reformation in theology and ethics. King Frederick III (called “The Wise”) authorized the composition of a unified confession of faith, which would serve as an official position for the Reformed churches. Two young Biblical scholars were commissioned to draft a reformed catechism: Zacharias Ursinus and Caspar Olevianus, who jointly authored the famous Heidelberg Catechism (1563), which became one of the great condensations of the Christian Gospel in that age. The Reformed Church moved to America in the colonial expansion. It gradually contributed to the cultural, economic, and educational enrichment of our young nation. In 1934 it merged with the Evangelical Synod of North America, which had a more pietistic-personalistic emphasis. The congregational wing of the United Church of Christ is slightly younger than the E & R side, but only by a few years. Whereas the Evangelical and Reformed historical beginnings are from the 16th century Europe, the Congregational Church goes back to 16th century England. The first congregational church in England was formed in Norwich, 1581. Robert Browne, pastor of that church, gave the first public formulation of the basic principle of congregationalism in his “Reformation Without Tarring For Annie.” The book was widely circulated and because of its influence early Congregationalists were dubbed “Brownists.” The Pilgrim Fathers were Congregationalists. Congregationalism came to American via Holland. Members of the Scrooby Meeting House, Nottinghamshire, settled in Massachusetts in the1620’s. The Salem Church Covenant was representative of American Congregationalism. The Pilgrims evidenced a heartiness and heroism, a perseverance and pragmatism that nerved them to defy dangers and helped them secure the wilderness for future generations. Education had top priority among early and late Congregational leaders, as it did among Reformed churchmen. Many of our oldest colleges and universities were started by Congregationalists. Also, Congregationalists were known for their ecumenical outlook and action. In 1931 they merged with the Christian Church, whose church government was the same. By the 19th century much of the early Calvinistic beliefs were relaxed in the Evangelical and Reformed Church and in the Congregational Church; yet an evangelical core remains. In the new United Church of Christ variations in personal belief are permitted and each congregation is encouraged to restudy and restate the Christian Faith. The Statement of Faith, approved in 1959, is the official denominational doctrinal position. The house which Judge Johannes Fogel built in 1798 in Macungie Township became the nucleus of Fogelsville. In the course of time a considerable number of houses were built with a consequent increase in population. These people all had church membership somewhere, chiefly in the Trexlertown, Ziegels and Jordan congregations, and it was natural that they should want a church of their own. This sentiment crystallized in a meeting called at some time during the year 1834 at the public house of George Guth. At this meeting Judge Fogel and Jacob Mayer, both Reformed, each offered to give one hundred and twenty perches of ground on which to build the church. 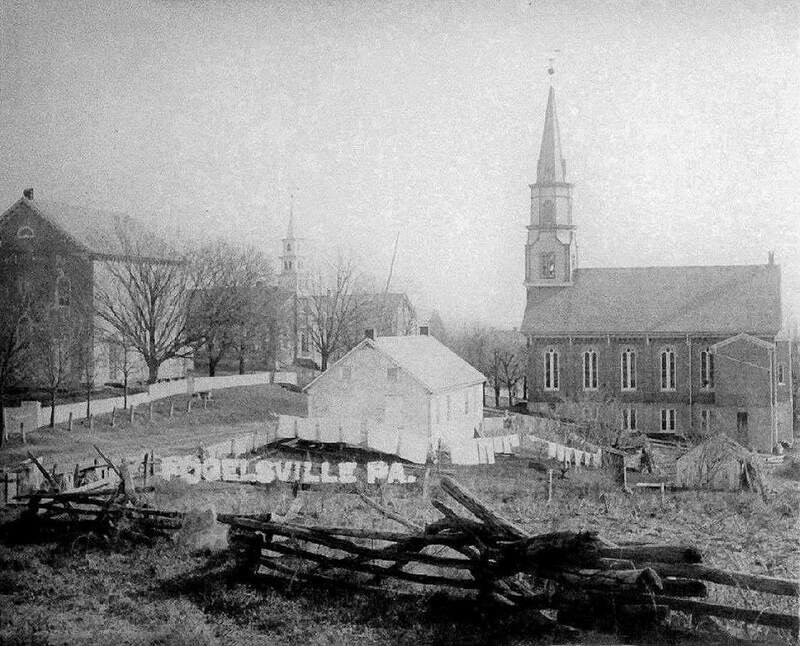 The church stands on the land given by Judge Fogel, and the old cemetery ground was given by Jacob Mayer. Later on, Solomon Fogel gave one-half acre of ground east of the church for burial purposes, with the proviso that this plot should not be used for said burial purposes until the old cemetery was filled. The two congregations were formed with the following organizations: Elders, Jacob Mayer (R), and Adam Litzenberger (L); Deacons, Joseph Frye (R), Henry Rauch (R), Jonathan Mohr (R), Isaac Haas (R), Samuel Fetterolf (L), John Lichtenwalner (L), Henry Stettler (L), Daniel Kuhns (L); Treasurer, Solomon Fogel (R). ​The Building Committee was: Jacob Mayer (R), Henry Mohr (R), Daniel Schlauch (L), and Jacob Steininger (L). The committee to solicit subscriptions consisted of Brig. Gen. Benjamin Fogel (R), Jonathan Mohr (R), John Keck (L), Peter Musselman (L), to which Jacob Mohr, Isaac Haas, and Joseph DeLong (all R) were added later. The first entry in the treasurer’s record under date of November 8, 1834, was for moneys received toward the erection of a new church. $212.00 was received by the treasurer before the year 1834 ended. Daniel Fusselman had charge of the carpenters and Samuel Fetterolf of the stone masons. Carpentry cost $761.00; masonry and plastering, $364.79; painting $67.30; quarrying the stone used in the construction of the church, $40.32 ½ ; hauling 492 barrels of water, $44.28; splitting 11,000 laths by hand, $5.50; blacksmith’s work, $106.47; 1¼” Y,O, flooring, $13.50; 1 ¼” W.P. panel, $16.50; 1 ¼” common, $11.50; hemlock, $8.50. The lumber had been bought in Mauch Chunk and hauled by canal boat to Allentown. Wages paid in those days were very low, but whether low or not, almost everybody had saved money, contradicting much of the fallacious economic theory of the present day. The wages for common labor ranged from .25 to .39 per day, a day being the time between sunrise and sunset. The total receipts, November 8, 1834, to February 13, 1836 were $2,492.28 and the balance in the hands of the treasurer on above date was $260.51 ½ . The cornerstone was laid May 9, 1835. The services were conducted by the Rev. Joseph Dubbs, pastor of Union Church, Neffs, and Isaac Roeller, who also preached the sermons. The “Proklamation” was read by the Rev. George Wartman, also a pastor of Union Church, Neffs. The new church was designated as St. John’s Lutheran and Reformed Church, very interesting because all the land and more than two-thirds of all the moneys were contributed by the Reformed members. The principal donors were: Judge John Fogel, $230.00, 120 perches of land and all the stone and coarse sand used in the construction of the building. Dedicatory services were held on Saturday, October 31, and Sunday November 1, 1835. The Revs. Joshua Yeager and Isaac Roeller preached on the first day and the Revs. C.G. Herman and Gottlieb Yeager had charge of the services on Sunday. It must have been a gala event in the community. The Allentown Band contributed its share, probably gratis, for the treasurer’s record shows that he paid $10.00 for meals for the band. The collections for the four services were $276.95. The congregation was organized but was pastor-less until the middle of November. The records are very meager but it is believed that Rev. Alfred J. Herman was elected pastor of the Reformed charge and Rev. Isaac Roeller was elected pastor of the Lutheran congregation. 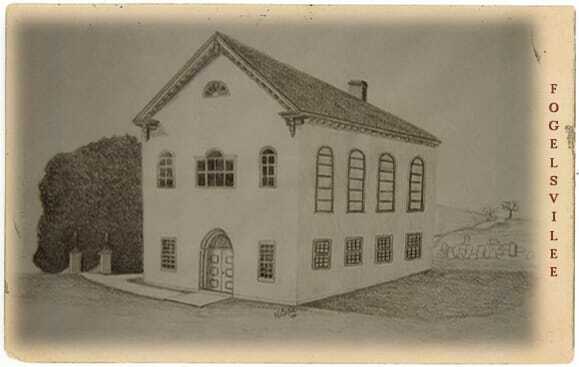 The first Reformed communion was held on May 6, 1836.The first confirmation class consisted of Samuel Mayer, Gideon Freas, John Scherer, Elias George, Reuben George, Lena Mohr, Louisa Hamm, Polly Freas, Lena Haas, and Polly Fenstermaker. Both pastors received the same salary: $81.11 for 1836, $81 for 1837, $83.78 for 1838. Thirty years later, Pastor Herman received $125.56. The first Refomed pastor, as stated before, was the Rev. Charles G. Herman, who served until February 23, 1862, when he was succeeded by his son, Alfred J. Herman. In 1896, a group of Lutherans left St. John’s and organized a new church across the street. The remaining Lutherans either converted or joined other area churches. The Rev. Alfred J. Herman served until 1901 when ill health and age forced him to retire. His successor was the Rev. James O. Oswald who resigned in 1904. In the interval between his departure and the election of his successor – almost a year- the following occupied the pulpit: the Revs. D. E. Schoedler, Drs. John DeLong, G.W. Richards and J.G. Rupp. The Rev. Frank P. Laros preached a trial sermon on October 12, 1905, and was installed as pastor of the Zion-Lehigh Charge (consisting of Lehigh,Weisenberg, Seiberlingsville, and Fogelsville), serving until 1929. Again a year passed and during that time the following conducted services at St. John’s: Drs. W.F. Curtis, J.M.S. Isenberg, J.G.Rupp, and the Revs. J.L.Guth, Hamm, Baumer, Kunkle, Krick, Frantz (H.A), Rothermel (J.R.) and Brown. The Rev William O. Wolford was installed in May 1930. During Rev. Wolford’s pastorate, the parsonage was built and the number of duplex envelopes (introduced in 1919) increased from 150 to 235 in 1935. Rev. Alfred Jasper Herman Sr – Rev. Herman’s date of birth is November 6, 1831 and his date of death is November 9, 1911. He was the son of Rev. Charles G. Herman and the grandson of Rev. Dr. Lebrecht Friedrich Herman, who was the founder of the Herman Family of Reformed Ministers in Pa. He received private instruction at home under the direction of his father and then prepared for college at the Easton (Pa.) Academy. He was a student at the University of New York until about 1849, when he began his theological studies in preparation for the ministry under the supervision of Rev. Dr. J. C. Guldin. He was ordained in 1851 and ordained as assistant to his father, pastor of the Maxatawny Charge. When his father retired he became pastor of the Charge it consisted of as many as eight congregations: Zion’s, Delong’s at Bowers, Huffs, Fogelsville, Seiberlingville, Weissenberg, Wesserville, and Topton. He organized St. Paul’s at Seiberlingville and St. Peter’s at Topton. He baptized 3000 persons, confirmed 2600, officiated at 1800 funerals. On June 14, 1853 he married Miss Isabella Grim, daughter of John and Anna Grim of Lehigh County. He was survived by his widow and three children. Two of his grandsons, Revs. Charles G Beck and Alfred Jasper Herman Jr., were ministers. ​Rev. James O. Oswald - Rev. Oswald was born in Albany Township, Berks County, Pa., on November 6, 1868. Afterwards the family moved to Lancaster. At the age of sixteen he began to teach at Eckville in Berks County. After teaching in the public schools for eight years, he entered Eastman’s Business College at Pougheepsie, N.Y., graduating in 1895. In the fall of that year he entered Franklin and Marshall College, graduating in 1899. He was licensed and ordained by Lehigh Classis in 1899. From 1902 until 1904 Rev. Oswald was pastor of Zion’s charge, Weisenberg, Pa., which included the Fogelsville charge, and from 1904 until March 1, 1910, he served the Great Swamp and Chestnut Hill charge, Spinnerstown, Pa. In March, 1910, he became pastor of the Frieden’s charge, Slatington, Pa., and served there until the end of his life. He was buried in the Cemetery of the Jacksonville Church. At the time of his death Rev. Oswald was President of the Board of Trustees of the Phoebe Home. He was married to Miss Lettie N. Lutz, who survived him with one daughter. ​Rev. Frank P. Laros – Rev. Laros’s date of birth was March 22, 1877, and date of death was May 7, 1929. He was the son of Jesse and Maria (Mohr) Laros. He entered Ursinus Academy in 1889, and graduated in 1897 and the Ursinus School of Theology in 1900 and ordained that same year. He married Miss Carrie S Stahl of Philadelphia on October 22, 1901. On October 19,1900 he was installed as pastor of St. Paul’s Reformed Church at Pottstown, Pa until 1905. He than became pastor of the Lehigh-Zion Charge near Alburtis, St. John’s at Fogelsville, St. Paul’s and Weissenberg. Rev Laros suffered from Diabetes for two years and became worse in the spring of 1929 and died in the Allentown Hospital after being admitted there for one week. ​Rev. William O Wolford – Rev. Wolford’s date of birth was February 12,1899, and his date of death was January 23, 1986. He was born in Salfordville, Pa. and was a graduate of Salfordville Public Schools, Perkiomen Preparatory School in 1917, Ursinus College in 1921, and Franklin and Marshall Seminary in 1924. Rev. Wolford married Helen M. Givler on June 4, 1924. Helen was the daughter of Mr. and Mrs. Harry Saunders of Palmyra, Pa. Rev. Wolford and Helen were the parents of William H., Robert, and Janet Hollis and grandfather of 9. His first charge was the Great Swamp charge in the Spinnerstown area from 1924 to 1926. He then became pastor of the First Reformed Church of Palmerton from 1926 to 1930. From Palmerton he moved to the Lehigh-Zion charge of which Fogelsville U.C.C. was a part and served 33 years from 1930 to his retirement in 1963. ​Rev. H. Neil Mumma – Rev. Mumma was born in Lancaster, Pa. on July 13, 1938 to Howard and Thelma Mumma. He graduated from McCasky High School and received his Bachelor of Arts degree from Franklin and Marshall College in 1961. He earned both his Bachelor of Divinity degree and Master of Theology degree from Lancaster Theological Seminary in 1964 and 1970, respectively. In 1964 Rev. Mumma was ordained in Lancaster, and began as the pastor of the Fogelsville-Weisenberg charge. He served as pastor of the Mt Pleasant charge near Pittsburgh from 1970 to 1984 and then he served St. Paul’s U.C.C. in Northampton from 1984 to 2002, when he retired. Since then he has served as an interim minister at Hope U.C.C. Wind Gap (2003-2004) and at Christ U.C.C. Bath (2004-2005). From 2006 to 2009 he served as the preaching pastor of Holy Trinity Lutheran Church, Northampton. Over the years he has been involved with the Penn West and Northeast Conference, and the General Synod XIV in various capacities. Rev. Mumma was married on June 8, 1964, to the former Nancy L. Mayer, daughter of Mr. and Mrs. Wilbur Mayer of York, Pa. They are the parents of Christine Garritano and Neil and grandparents of four granddaughters. Pastor Mumma enjoys time with his granddaughters, exercising (walking with Nancy), going on trips, reading (especially mystery novels) riding his bike, collecting sports cards and playing the trumpet in The Mike Skweir Orchestra. ​Rev. Howard W. Walenta – Rev. Walenta’s date of birth was November 26, 1916, and his date of death was April 10, 1985. He was born to Rev. and Mrs. M.J.H. Walenta of Brooklyn, N.Y. Rev. Walenta received his bachelor’s degree from Columbia University, NYC in 1940. On July 21, 1940 he married Ruth Fleming, the daughter of Mr. and Mrs. Robert H. Fleming of NYC. 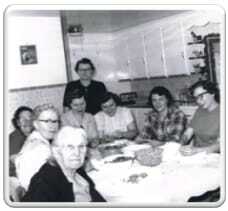 They were the parents of Irene Chamberlain, Marion McCullough, Walter, and Janet, and four grandchildren. Rev. Walenta’s former pastorates include: L.I. (1940-1945), The Dubois Charge, DuBois Pa. (1945 – 1957), and Calvary U.C.C., Bethlehem, Pa. (1957-1969). Rev. Walenta became pastor of the Fogelsville – Weisenberg charge on January 1, 1970. and was chairman of the Worship Committee Association and President of the S.W. Cluster. ​Rev. David Massey – Rev. Massey served our church from June 1, 1984 to November 15, 1992. He is living in Maryland with his wife Angela and is serving Grace Reformed Church United Church of Christ in Washington, D.C.
​Rev. Frank Spada – Rev. Spada was born on June 14, 1937, in Flushing, NY. His parents were Joseph and Alyce Spada. He graduated from McBurney HS, Hofstra University, and Hempstead, NY, with a BA in Social Science and History; Princeton Theology Seminary, Master of Divinity. Additional education includes Clinical Pastoral Education, and as an Accredited Interim Ministry Specialist. Rev. Spada is married to Maria (Evola) Spada who is a graduate of Moravian Theological Seminary and a Pastor in Bethlehem, Pa. Frank has two children from a previous marriage and three grandchildren. He achieved the rank of Eagle and the God and Country award in Boy Scouts. He was baptized and received first communion in the Roman Catholic Church. At the age of 14 he joined the Dutch Reformed Church in Flushing, NY, and was confirmed in 1951. He taught Sunday school and was a Deacon in the church. When the Reformed Church merged with a UCC church he began studying to become a Lay Preacher in the UCC. In October 1980 he served St. Paul’s UCC in Summit Hill, Pa. and was ordained November of 1980. A new calling was to Interim Ministry and after training he served as Interim Pastor of 8 UCC churches, which included St. John’s Fogelsville. Retiring January 2002, he began Stated Supply and is now serving St. Peter’s UCC, in Parryville, Pa. Rev. Spada also served the Penn N.E. Conference. ​Rev. Earl Marks – Rev. Marks was born on May 8, 1927. He graduated from Richland H.S. on May 1945, and Lebanon Valley College in August 1947, and Lancaster Theological Seminary on May 1950. Rev. Marks has served Lykens Valley Charge from May 1950, to May 1959, and the Heidelberg Charge from May 1959 to June 1964. He served the Penn Northeast Conference from July 1964 to December 1984, and Phoebe Home Chaplain from June 1985 to June 1992. He served the following UCC charges: Chestnut Hill, from July 1985 to December 1992, Morganland, from August 1993 to December 1993, Fogelsville, from August 1994 to November 1994, and Jordan from December 1996 to February 1998. On October 28, 1950 Rev. Marks married Arlene (nee Wiest).They have a daughter, Holly Sue. ​Rev. Irvin Moore, Jr. – Rev. Moore was born in Reading, Pa. on March 3, 1939 to Irvin Moore Sr. and Margaret (nee Thompson). He received his education from Pennside Elementary and Muhlenberg Jr. High and H.S. in Muhlenberg Township, Reading, Pa., graduating in 1957. He graduated from Ursinus College with a major in History, B.A., in 1961 and Lancaster Theological Seminary, B.D., in 1965. The UCC parishes that he has served in Pa. are Egypt, Whitehall, 1965 to 1975, St. John’s, Coopersburg, 1975 to 1980. Flicksville, 1983 to 1992, and St. John’s, Fogelsville, 1992 to 2002. He presently serves St. John’s Palmerton as a part-time pastor. Rev Moore was married to Carolyn (nee Cressman) from 1963 to 2002 (Divorced 2002). They are the parents of Rebecca Morrell, and Susan Moore, Rebecca has two children, Aaron and Joshua Morrell. ​Rev. David R. Schnaars – Rev. Schnaars is a third-career minister who graduated from Lancaster Theological Seminary in 1994, was ordained by the New Jersey Association of the Central Atlantic Conference, and took additional training offered by the Interim Ministry Network, an ecumenical association that specializes in training and supporting interim ministers. Pastor Dave has standing with the Penn Northeast Conference in which he has served since 1994. Pastor Dave is accompanied by Diane, his wife of forty-one years. They met at Bloomsburg University (then a State Teachers College) and have lived in several areas of eastern U.S. They currently reside in Slatington, PA and have two grown children and five grandchildren. Diane works for a social research company that collects data on family healthcare expenditures. Past occupations for Pastor Dave include multi-unit management in the fast food industry and computer hard and software sales. Dave and Diane’s favorite pastime is playing with grandchildren. ​Rev. Joanne P. Marchetto – Rev. Joanne P. Leib Marchetto began her pastorate at St. John’s UCC on November 15, 2004. She was born in Goshen, NY on May 16, 1975. She graduated from Goshen Central Schools in May 1993. She attended Kean University, where she received a B.A. in History, with honors. She then attended Lancaster Theological Seminary and received her M. Div. degree in May 2004. Currently, she is enrolled in the Doctor of Ministry program at Lancaster Seminary working toward her degree. On August 10, 2002, she married James C. Marchetto. They have two children: a daughter, Anna and a son, Jackson. Pastor Joanne serves the Penn Northeast Conference as the chairperson of the GEM Fund Team and is on the licensing and commissioning in-care committee. Daniel Miller 1835 – ? It is believed that a man by the name of Stettler provided music with his violin because there was no organ in the church. Miss M.G.Fogel 1918 – ? 1834 – A meeting was held to decide to build a joint union church. 1835 – The corner stone was laid May 9th. 1835 – Dedication Services were held on November 1st. 1836 – The church was painted at a cost of $67.30. We believe that the cost of the church was about $2,781.46. Donations were a large Bible, logs for laths, 240 perches of land, stones and coarse sand, 20 bushels of hair, 375 ft. spruce boards, 295 days work, 3 days hauling, 2 days smith work, 11 logs and 4 rafter poles. 1836 -The first Reformed communion service was held in May. 1836 -The first Reformed Catechetical class was confirmed. 1837 – The first Lutheran communion service was held. 1861 – The church was painted. 1866 – A “harmonium” was purchased at a cost of $200.00. 1873 – A part of the Lutheran Church congregation withdrew. 1878 – The “gallery” was left in the church instead of removing it and a new basement was made in the church. The old pews with gates were removed for more comfortable ones and alterations on the front of the gallery were completed. 1896 – Separate Reformed and Lutheran congregations were formed. 1904 – The Union Cemetery Association of Fogelsville was organized. 1906 – An acre of ground was donated by Lehigh Portland Cement Co.
1910 – Pastor Laros suggested that the Ladies Guild should be formed to assist with raising additional funds. 1910 – Gen. H.C.Trexler donated 150 barrels of cement for the remodeling of the church. It was said that while construction was going on there was a hailstorm or lightning and one of the mules that was used was hit while it was inside the church. 1910 – The Ladies Guild was organized. 1911 – The church was incorporated. 1911 – A twenty-foot addition yielded more space for both church and Sunday School. The Gallery was torn out, a new church with sloping floor and new ceiling was constructed, new and more comfortable pews replaced the old ones, an acetylene lighting system was installed, a new pulpit and altar furniture made the church more attractive, the walls were frescoed, stained glass windows took the place of the old plain windows and the entire church was carpeted. 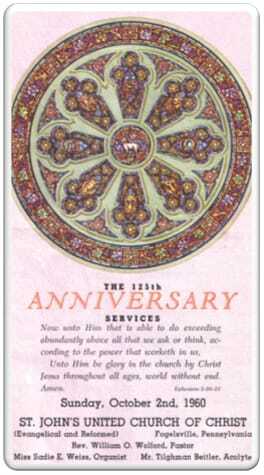 1911 – Dedication services were conducted in German. 1913 – A Durner Organ was dedicated. Andrew Carnegie gave a gift of $750.00 on the condition that the congregation raise $1,250.00 within a specified time. Thanks for this gift are due to Miss Minnie G. Fogel. 1919 – Electric lights were installed. 1922 – The exterior of the church was painted for $220.32. 1922 – The pastor was granted a vacation during the month of August at full pay. 1922 – A Ford Coupe was purchased for Rev. F. P Laros. 1923 – A blower was installed. 1927 – The Union Cemetery Association of Fogelsville was incorporated. 1929 – Pastor Laros died. 1929 – The secretary of the consistory was given a salary. 1930 – The congregation paid its apportionment in full. 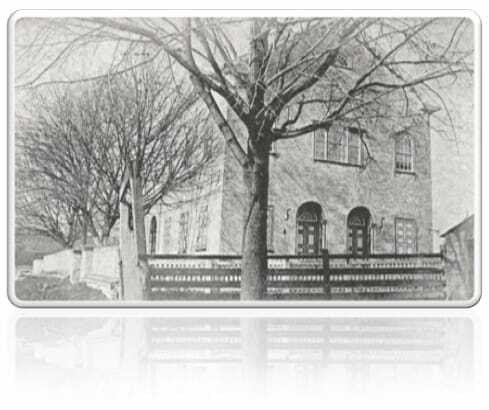 1930 – Pastor Wolford asked the Ladies Guild to build a house for him in Fogelsville. A lot was purchased for $600.00 and the house was built for approximately $7,000.00. This house is located at 7725 Main Street. 1932 – The gravestones on the old cemetery were realigned and improvements were made. 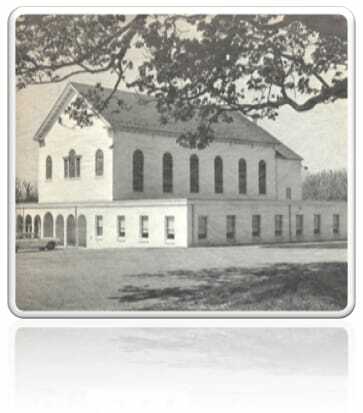 1935 – There were 236 members at St. John’s Reformed Church. A 100 year history of St. John’s was compiled and a celebration was had. 1940 – All of the Ladies Guild equipment was sold and it disbanded. 1954 – A two story addition was added to the church consisting of the kitchen, rest rooms, and choir room at a cost of $43,800.00. Dedication services were held June 20, 1954. 1955 – The Ladies Guild was reorganized. 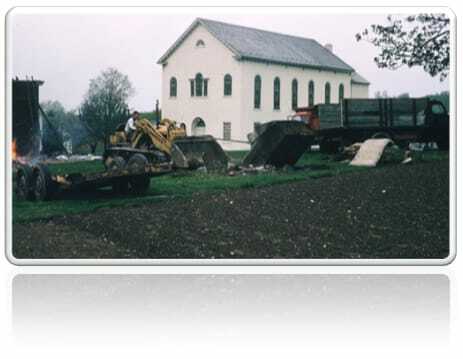 1958 – Construction of the present parking lot was completed and the school house adjacent to the church was demolished for a cost of $6,160.00. 1963 – The four-church charge was divided and was now the Fogelsville-Weisenberg Charge. 1967 – The Sunday school addition along side of the church was added for a cost of approximately $82,000.00. 1968 – The cornerstone ceremony was held on Feb 11th. 1968 – The church school addition was dedicated on June 2nd. 1974 – The exterior of the church was painted. 1977 – Restoration of the stained glass windows was completed. 1978 – Installation of the storm windows was completed in 1979. 1979 – The parking lot was resurfaced. 1980 – The bell from the old school house was mounted in a frame which also contains the bulletin board in the front of the church. 1981 – Ceiling fans were installed. 1983 – The exterior of the church was painted. 1983 – The Fogelsville-Weisenberg charge was disbanded. 1984 – St. John’s entered into a “sale of pastorial service agreement” with Christ Church (UCC) at Lowhill. 1984 – The interior of the church was painted. 1984 – The first family visitation with the membership at approximately 268 was held. On September 30, St. John’s celebrated their 150th anniversary. 1991 – A new roof was installed on the church. 1991 – A ramp was installed in the choir room. 1995 – The amplification system was installed. 1995 – A new boiler was installed to improve the heating system. 1996 – Repairs were made on the driveway along the side of the church. 1997 – New carpeting for the hall and Sunday school rooms was installed. 1998 – New carpeting was installed in the office. 1998 – Folding tables were purchased for the large Sunday room. 1999 – Landscaping along the front of the church was done. 2001 – The stained glass windows were repaired. 2001 – The exterior of church was painted and repaired. 2001 – The railing and concrete steps by the street were replaced. 2002 – The heating and electrical system was updated, and the interior church walls were painted. 2004 – A new sound system was installed. 2004 – The electrical service was upgraded to 400 AMPS to accommodate the new air conditioning system. 2004 – The church and cemetery were surveyed. 2006 – A security system was installed. 2007 – The elevator (lift) was installed. 2007 – Renovations were done to the foyer and the bathrooms. 2008 – The family room was updated. 2008 – Pew cushions were donated by Mildred Lehr, a member of the congregation. 2009 – The Old German Cemetery was restored. ​The Ladies Guild was organized in 1910 to raise money for church expenses. After the school house was demolished the women of the Guild served meals at the Community Park, North Fogelsville. As a result of these raisings, the parsonage was built. For the 100th anniversary of the church Leona Kocher was asked to write some information about the Guild. She said “What comes to mind is something so often forgotten. The women had the forsight to organize a guild to raise money for church expenses.” They were dedicated to their work but had very little to work with. Mrs. Kocher could recall that they waited on tables when they had an Oyster Supper in the old school house, plus served a dinner for the public when the church celebrated it’s 100th Anniversary. They cooked on kerosene stoves had no running water, and no appliances like we have today. They also quilted every Wednesday making many heirlooms. She mentioned these women: Mrs. George (Annie) Moritz, who was the president and organizer. Emma Sechler did all the marking for the quilts, having worn out many oil cloth table covers. Some of the other regulars were: Cora Smith, Annie Walters, Jennie Smith, Minnie Kocher, Lousia Fritzinger, Sara Barner and Minnie Fogel. Then the peanut factory was opened. Nine or ten women got together every 2 or 3 weeks at Paul & Eva Breininger’s wash house to fry and bag peanuts. This was a money raiser for many years. Next came the cashew factory which was opened on Carl Kocher’s patio. Leona fried the nuts and Marge Cope weighed and packaged them. Irene Fritzinger and Hilda Moritz made pompoms. In 1940, all the Guild equipment was sold and the Guild was disbanded, but in 1955 the Guild was reorganized. 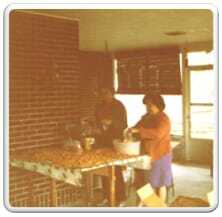 They continued the tradition of roasting peanuts, cashews, and making pompoms. Other items sold were candy, cookies, petit fours, vanilla extract, umbrellas, dish cloths and knives. At one time the Guild entered a contest at radio station WHOL called “Name That Tune”. As a result $300.00 was won and lots of telephone dials were worn out. The Guild also began a tradition with “Breakfast at Walps.” Various prized were available by bidding with Trexler Park labels which women collected. Other fund raisers were Chicken Bar-B-Ques, Christmas Bazaars, Bakeless Bake sales, flea markets with Chinese Auctions, and beef raffles. The Guild has played a very important part in the history of St. John’s. Through the dedication of it’s sometimes few workers it has provided a beautiful nursery in memory of Mrs. William O Wolford, a bulletin board, a well-equipped kitchen and carpeting for the church. The Ladies Guild disbanded in 1987. Hilda Moritz said in her report for the 150th Anniversary that all of the above money raisers were possible only with the cooperation and efforts of the Guild and the church members. The members of the Ladies Guild were: Virginia Meitzler, President, Gladys Rupp, Vice President, Verna Peters, Treasurer, Gloria Wolford, Recording Secretary, Betty Rockel, Financial Secretary, Florence Laudenslager, Sinking Fund and Ida Longenbach, Chaplain. 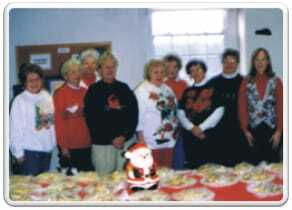 In 1992 a group, which we now know as the Busy Bees, was formed, They have many fund raising projects with a majority of its monies being used for the church renovations. Some of their fund raising projects include sales of ham & cheese and hoagie sandwiches, soups, cookies, sticky buns, Entertainment books and shoofly pies. Other projects were drawings and auctions for quilts and items for Dutch Days or church picnics. The women have served luncheons after funerals, pastor cluster meetings, Pastor Joanne’s baby shower, a supper for the Penn Northeast Conference Annual Meeting and soup and sandwich suppers before Maundy Thursday services. Some of the items that the Busy Bees have assisted in are window repairs as well as shades for all the Sunday School windows, electric water heater for the kitchen and ladies room, amp & modules for the speaker system, church signs used for fund raisers, cabinet for the kitchen as well as a refrigerator, vacuum cleaner, carpets, carpet cleaning and repairs. Computer and software, driveway repair, tables for the Sunday school rooms, Bibles for Kid’s Peace and the exterminator to rid us of pesky critters. Larger projects received donations from the Busy Bees for Project Genesis toward the repair of the stained glass windows in 2000, painting of the church in 2001, General fund in 2002, church renovations in 2007, redecorating the Family Room, pew cushions for the handicap pews, and chairs for the large Sunday School room. The total for the above items is well over $50,000.00. Our late Pastor Howard Walenta said it all when he wrote: “For our church to continue, each of us must be a good relay runner, taking the baton from our fore-runners and passing it on faithfully to those who follow. A church is many members, not just one”. Ground for the first part of the cemetery was given by Jacob Mayer in 1834. This would be the Old German Cemetery as we know it today. From 1834 – 1835 until 1904 the cemetery was managed by a committee of both the German Reformed and German Lutheran Congregations. In 1904 the Union Cemetery Association of Fogelsville was created to manage the cemetery. The “Board” consisted of eight officers, four from each congregation. There were four officers and four trustees/directors. In 1906 General and Mrs. Harry Trexler (through Lehigh Portland Cement Company) donated one acre of land (east of the Old German Cemetery) for burial purposes, provided part of the land would be used as a “Potter’s Burial Plot.” The balance would be sold for burial plots. This is now known as Section “B”. The Cemetery was incorporated on November 22, 1926. In 1932 the gravestones on the Old German Cemetery were realigned and the cemetery generally improved at a cost of $497.79. As of January 1, 1935, the Perpetual Care Fund totaled $3,887.50. Section “A” of the cemetery (E. of the church building) was acquired by multiple purchases and gifts. In the 1940’s the cemetery purchased an acre of ground from Lehigh Portland Cement Company (east of Section B), today know as Section “C”. In the late 1950’s an additional three and a half acres were purchased from Lehigh Portland Cement Company (east of Section “C”). Currently we are in an agreement with the Jaindl Land Company to exchange the 1950’s purchase for land north of the Old German Cemetery and Section “B”. This will give the cemetery better control of the property and will assure burial grounds for a long time. During 2009 the Cemetery completed a restoration project on the Old German Cemetery at a cost of forty thousand dollars, funded by a ten thousand dollar grant from the Pa. Department of Community and Economic Development and contributions of one thousand dollars from the Fogelsville Historical Committee and the balance from a friend of the Association. As of January 1, 2009, the Perpetual Care Fund totaled $109,417.00. Fred A. J. Haas, Sec. Morning Services at 10:15 A.M. Afternoon Services at 2 P.M.
Anthems: Christ Reformed Choir from Bath Pa.
Evening Services at 7:15 P.M. The Sermon: Rev. James E Wagner, D.D. The Sermon: Rev. Robert V Moss, Ph.D. Organ flowers were donated by Mr and Mrs Milton Haas, as the oldest married couple, celebrating their sixtieth anniversary on January 23, 1961. Rev. James E Wagner, D.D., President of the Evangelical and Reformed Church and Co-President the U.C.C., and Rev. Robert V Moss, Ph.D., President of the Lancaster Theological Seminary , delivered the messages for the anniversary. The parking lights were being used for the first time for this event. Invocation – Rev. Paul P. Haas D.D. Former Pastors: Revs. William O. Wolford, H. Neil Mumma, Howard W. Walenta. The banquet was held on Saturday, September 29, 1984 at the Germansville Fire Co. with special music preformed by the Heidelberg Hand Bell Choir. Slides were shown by Henry Rockel and Carson Frey for all to enjoy and all of the confirmation classes present were recognized. On Sunday, September 30, 1984 a piano and organ recital was preformed by Mr. and Mrs. Richard Van Auken at our church. Co-chairpersons Sharon Broscious and Gladys Rupp. Celebrating its 175th Anniversary in 2010, numerous activities have been planned to note this historic occasion. Kicking off the celebration, we had a Pennsylvania Dutch Day service. Lee Haas was the speaker and the Miller Brothers provided music and entertainment. February 21, 2010 Youth Service 10:30 A.M.
May 2, 2010 Reformed Communion Service 10:30 A.M.
September 26, 2010 PA.. Dutch Service and Dinner 10:30 A.M.
North Whitehall Ambulance Building 4:30 P.M.
October 31, 2010 Rededication Celebration Worship Svc. 10:30A.M. Rev. Alan Miller. Conference Minister will preached the message. Kay Kleinschuster, Marilyn Roth, Ray Ziegler, Gladys Rupp (in memory), Herman Rupp, Henry Rockel, Betty Rockel, Gerald Roth (in memory).